Work has begun to excavate a grave in southern Spain that is believed to contain the remains of the poet and dramatist Federico Garcia Lorca. He was murdered by supporters of General Franco during the early weeks of the Spanish Civil War. 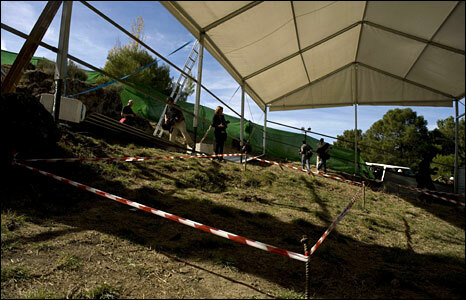 The grave in the province of Granada is being opened at the request of another victim's family. Lorca's relatives had initially opposed an exhumation but now say they may provide a DNA sample to assist with ID. Lorca was shot dead in August 1936. Historians think he was then buried with at least three other men beside a winding mountain road. At that spot, 200 sq m of dry earth have been cordoned off and covered with an awning, giving it the air of a crime scene investigation. Archaeologists will dig by hand, focusing on four areas identified as potential graves by ground radar equipment. Such is the secrecy around the project that those involved have been stripped of camera phones, to prevent any publication of unauthorised photographs. 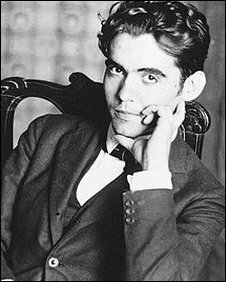 Lorca died aged 38, murdered for his left-wing views, Republican sympathies and homosexuality - all of which made him a target for followers of Franco at the start of the civil war. The exhumation and subsequent forensic work is expected to take up to two months, after which the final chapter of the Lorca biography might finally be written.